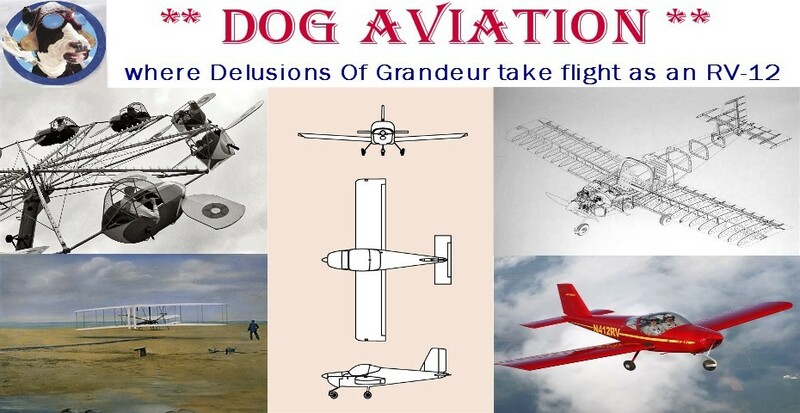 Frequent readers of the DOG Aviation Blog may have noticed there has been a lull in activity as of late … that is because the RV-12 was scheduled for its airworthiness inspection on Monday but earlier last week the FAA inspector called to inform me he would have to reschedule the inspection for later in the month. With that bad news, I have been taking my time chipping away at the necessary tasks that need to be completed prior to the inspection. Yesterday, completed the last remaining major task that needed to be completed prior to the inspection … the Weight & Balance calculations. This task requires placing all the access panels, cowlings, fairings and associated screws & hardware on the aircraft and installing the seat backs and cushions. No fuel is to be in the fuel tank … but the water and oil are to be left in the engine for the measurement. Not only is the weight of the aircraft measured but the distance from the leading edge of the wing to the center point of each wheel axle is also measured for the necessary calculations. Prior to making any of the measurements, the aircraft needs to be leveled. Van’s suggests using 2” blocks as a starting point and adjusting down or up from there as necessary. Bernie had loaned me a set of trailer ramps and I found the lowest level of 2” was too high …. after a little playing around with the digital level, discovered a 1 x 12 side from one of the shipping crates was the perfect thickness under the main wheels to level the aircraft at the canopy deck … so the ends were cut at a 45 degree angle so the tires could easily roll up on the boards. With the fore and aft now level, the side to side needed to be leveled as well … this required removing some air from the left tire. Fore and aft levelness was accomplished by rolling the main tires up onto a 1 x 12. Left to right levelness was accomplished by removing some air from the left tire. Rolling both main wheels up onto the 1 x 12 achieved a perfect levelness fore and aft. Prior to rolling the RV-12 onto the scales to measure the weight on each wheel, measurements need to be taken measuring from the leading edge of the wings to the center of the axles for the wheels. First a center point for the axels on both wheels needs to be established and marked on the floor. The digital level purchased for setting the propeller pitch also has a built in laser that shoots a beam of light which places a + on the object it is pointed towards. The laser came in handy for finding the center point of the axel and making an accurate mark on the floor directly below the wheel’s axel. Van’s plans suggest using a plum bob hung from the leading edge of the wing to make a mark on the floor in front of the axle for each wheel. I opted to use the 4 foot metal arts and crafts ruler (visible in the above photo) the DOG Aviation procurement department purchased long ago since it was long enough to touch the leading edge of the wing. The edge of metal ruler was placed against the leading edge of the wing and the digital level was used to verify the ruler was 90 degrees to the wing and 90 degreed to the floor …. when the positioning was verified, a mark was placed on the floor, this is done for both main gear wheels. The distance from the leading edge to the center of each main gear axle is measured and recorded on the Weight & Balance form as D1 & D3. A third measurement is required from the center of the nose wheel’s axle to the leading edge “line” … this is D2. This measurement was accomplished by using a metal tape measurer stretched under the fuselage to connect the leading edge marks made previously on the floor for the left and right side measurements for D1 & D3. A measurement is made from that “line” to the center of the nose wheel’s axle. Unfortunately, I forgot to take photos of the measurement process but below is a copy of the Weight and Balance form so one can see what was necessary … hopefully it will make sense after looking at the drawing on the form below. This is the Weight & Balance form … the measurements explained above were for D1, D2, and D3. Now for the actual weighing of the aircraft. The DOG Aviation procurement department took a tip from Don a RV-12 builder in Texas and purchased three Smart Weigh digital shipping and postal scales rated to 440 pounds that are quite accurate. I stepped on all three scales and they all showed the exact same weight within a tenth or two of a pound. Bernie got on the scales and said it was the weight he saw at the doctor’s office the day prior, so I feel pretty confident these postal scales will yield reasonably accurate results. The scales have a remote digital readout and a tare function that was used as explained later. Three Smart Weigh shipping and postal scales were purchased for measuring the weight on the DOG Aviation RV-12’s wheels. Measuring the weight on each wheel needs to be done with the aircraft level … this poses a small issue because ramps are need to accommodate the thickness of the scales and the boards used to level the aircraft. Fortunately, the ramps Bernie brought over saved the day after all. Bernie’s ramps were about as high as the scale with the leveling 1 x 12’s sitting on them … so what we did was roll the aircraft’s main gear up onto Bernie’s ramps. Next the two scales for the main wheels were placed in front of the wheels and turned on … once zeroed, the 1 x 12 boards were placed on the scales and the Tare function button was pushed to zero the scales with the wood on the scales. The board and scales were then slid up against the ramps and the aircraft was rolled onto the scales … then the ramps were slid back a little so they would not interfere with the readings. I then went back to the tail cone and pulled down on it while Bernie slid the third scale under the nose wheel. Presto … instant weight readings with the aircraft sitting level on all three scales. A note about the scales … they do time out after two minutes if the weight does not change, so while setting up we pushed on the aircraft’s wings occasionally to prevent a time out until we were ready to take the readings. The aircraft sitting on the three Smart Weigh postal scales. The two scales for the main gear need the 1 x 12 boards on top of the scales to make the aircraft level. The aircraft was first rolled onto the brown ramps seen behind the main gear. When the scales were in place and zeroed with the boards on the scales, the aircraft was rolled off the ramps and onto the scales as can be seen in this photo. One can see a little air was removed from the left tire to get the aircraft to level side to side. For fellow RV-12 builders interested in "the numbers", I knew she would be a little “chubby” … with all the accessories (excluding wheel pants yet to be installed), primer, second landing light, interior paint and backup instruments the Eagle weighed in at 746 pounds with an empty arm of 81.01 inches. The wheel weights recorded were … 148.6 lbs. on the nose gear, 289.7 lbs. on the left gear and 307.7 pounds on the right gear. The D1 measurement was 23 11/16" … D2 was 39 7/8" ….and D3 was 23 13/16". The casual observer may wonder why there is such an uneven weight between the left and right wheels … this is due to the backup instruments, mass of the ELT and its battery/antenna, the oil tank with oil, battery, coolant reservoir, fuel tank/fuel filler neck and associated hardware all being right of center on the aircraft. A special thanks goes out to Bernie for supplying the ramps which ultimately worked out fantastic and for all the assistance during the Weight & Balance measurement process.